Our weekly meal plans include 5 homemade dinner recipes and a dessert that are budget-friendly, easy-to-make, and fit into a busy weeknight schedule with a printable grocery list that is also linked to Walmart Grocery Pickup (to make grocery shopping extra easy)! 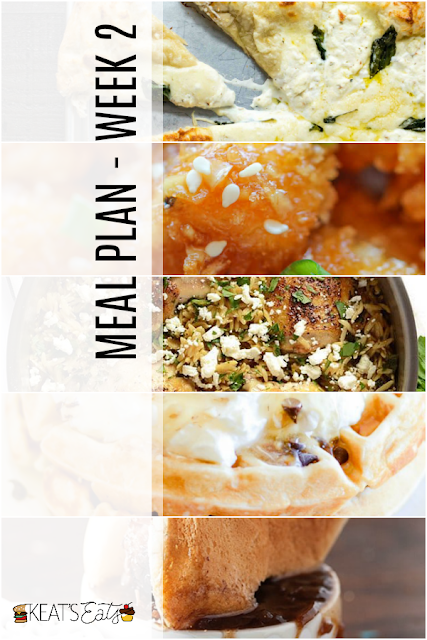 You can find all of our weekly meal plans here. 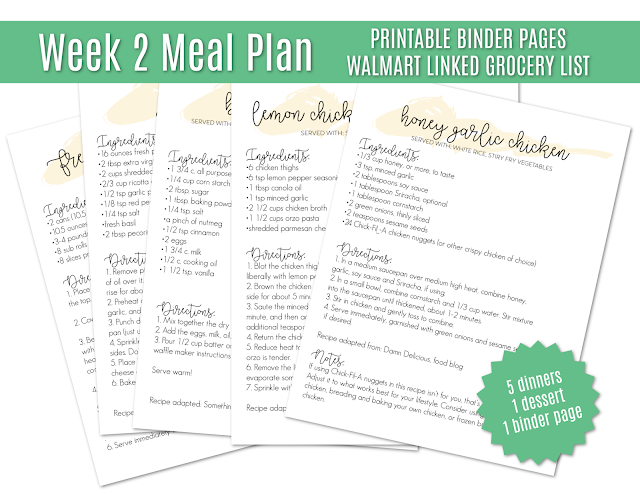 It took me a little longer than I had originally planned to get our Week 2 Meal Plan out the door. Mostly because I couldn't decide on the best format for sharing these recipes with all of you. I wanted to give you something easy and simple, but it still needed to be thorough and comprehensive. And most of all, I wanted to share a meal plan with you each week that I would personally use with my own family. After a couple of weeks, here's what I finally came up with. *My family ALWAYS eats breakfast for dinner on Sundays. So I'll always be including one breakfast recipes (we usually eat waffles or pancakes, but I'll try to shake it up for you guys). Feel free to use this recipe for a fancy Saturday morning breakfast if you're not into Brinner! ⚡️I'm having some difficulty with the links to the Walmart Grocery Pickup for this post. I'll work on it and try to get it updated ASAP!